Why do we need external scripts and why not refer internal scripts? They enhance the performance of website as they are cached by the browser from the CDN. Referring the following scripts will improve performance: <script src=”https://code.jquery.com/jquery-1.8.1.min.js”></script> because multiple sites use the same and the browser has to load it just once from the CDN and after that each time it is referenced, it is served from the browser cache. If instead of the above, a website refers scripts internally. That is, downloads the jquery-1.8.1.min.js file and serves it from its own root directory like <script src =”http://example.com/jquery-1.8.1.min.js”></script> then it will cause browsers to download load scripts from the internet instead of using it from the browsers cache that is downloaded from CDN as a result of which the performance is affected. We need external scripts because they allow developers to write less code and let them make DOM manipulations easy. Starting a web server on localhost at port 4545 serving the malicious JS. Attacker leaves the computer and victim uses it. Victim browsers the vulnerable website. The website launches and loads JS from the address http://127.0.0.1:4545/import.js and it results in XSS. Taking access of a computer within the intranet that has IP: 192.168.0.111. Starting a web server on it serving a malicious JS. The website launches and loads JS from the address http://192.168.0.111/import.js and it results in XSS. 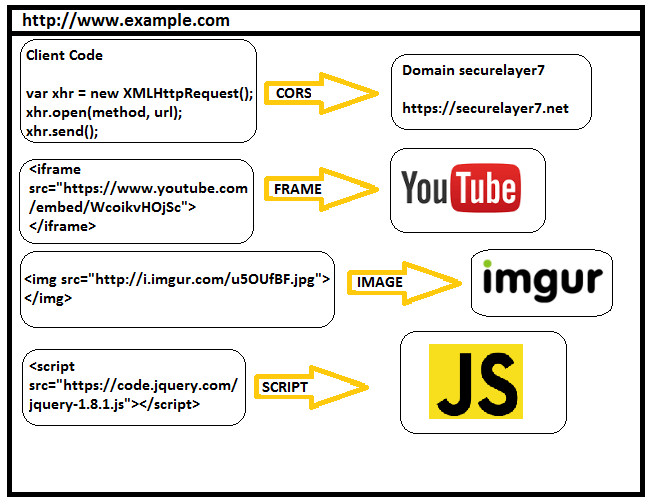 Registering the domain securelayer7.net and serving malicious JS. Any victim user that uses the website from a remote location will load the script from the newly registered domain and it results in XSS. Any victim user that uses the website from a remote location will load the script from the website on the old IP and it results in XSS. Attacker registers a domain with the incorrect name i.e. code.jqueri.com and serves malicious JS. Any victim user that uses the website from a remote location will load the script from the newly registered domain resulting in XSS. Being in a suitable position on the network. Performing a man in the middle attack and changing legitimate JS to serve malicious JS resulting in XSS. You can use the following <script> element to tell a browser that before executing the https://securelayer7.net/import.js script, the browser must first compare the script to the expected hash, and verify that there’s a match. As of now, it is supported by Mozilla Firefox, Google Chrome and Safari. The code (in development environment) which serves scripts from localhost or any private IP address should be replaced with secure code that serves scripts from secure location when the code is deployed in production. Monitoring of the existence of the domains should be continuously done in order to make sure that script is not referenced from a domain which is expired. Scripts should not be referred from a non-static IP address. Typing mistake should not be done while referencing scripts. Scripts should only be served from servers which have implemented HTTPS. Scripts should be served from a domain which you trust and which don’t have a RCE vulnerability. As it can lead to an attacker replacing the script that victim site references with malicious JS resulting in XSS in victim site. If you are unsure of the above point, then prefer to save the scripts on your own server rather than external reference.